I read about the article, One Glass, Seven Layers of Tea, in Wall Street Wall Journal, dated June 7, 2011 with so much delight and excitement. Thereafter I decided to blog it with the hope that you will like it. No surprise to me that many Bangladeshis travel hours to the sleepy town of Srimongol, in Bangladesh’s northeast, just for a cup of Romesh Ram Gour’s famous tea. I have occassionally done so especially for famous food. 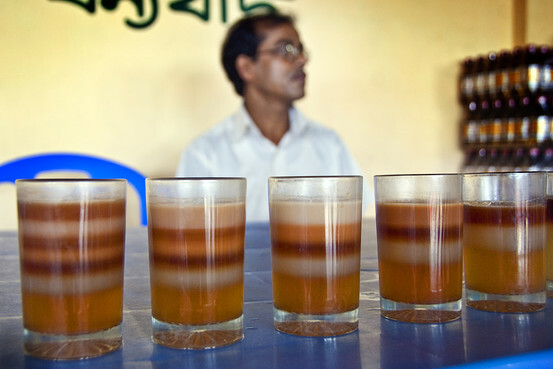 In a country of avid tea drinkers, Mr. Gour is the inventor behind the seven-layer tea which, he claims that no one else has been able to replicate. Copycats in the region have succeeded in creating at the most the five-layer teas, but none have been able to discover Mr. Gour’s rainbow brew secret. It was reported that Mr. Gour invented his colorful layered teas 10 years ago, when he was selling tea from a bamboo shack. By the time he realized that teas from different leaves have different densities, he then begun to embark on his experiment. After a year of experimenting, he could sell teas with more than two layers. Over the years, he learned to expand to seven. 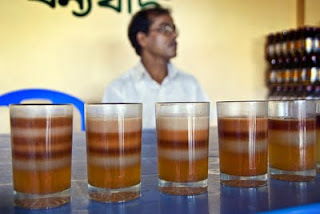 As such, the kind of layer tea Mr. Gour makes is unique to the Srimongol area. An iced three-layer tea has become popular in the Malaysian state of Sarawak, but those drinks include one type of tea and are typically layered with palm sugar on the bottom, evaporated milk in the middle and tea on the top. What makes Srimongol’s special are the discrete layers of tea blends. Here, I must admit that this is the first time I heard about it and I have not tried it before. For those who have tried it, Please tell us more about it, its taste and so on. I will definitely give it a try if I have a chance to be there. Append below please find its inventor and the seven layers tea for your viewing pleasure.